What makes Theodent different or better than other toothpaste? The inventors of Theodent toothpaste demonstrated that theobromine, an all-natural and organic compound found in chocolate, re-mineralizes and hardens tooth enamel at a greater rate than fluo- ride. The finding is significant because theobromine is the active ingredient in Rennou, the pat-ented chocolate extract contained in Theodent toothpastes. Theodent has two patents issued by the United States Patent and Trademark Office and another patent pending. What is the difference between Theodent Classic and Theodent 300? Theodent Classic is the main product and represents the first major innovation in oral care in over a century. Harnessing the power of the cocoa bean, Theodent classic boasts a non-toxic and revolutionary alternative to fluoride, Rennou. Theodent classic is ideal as a daily dentifrice alternative to fluoride therapies. If you desire or need the absolute highest dose of Rennou in the marketplace, Theodent 300 may be the right toothpast for you. Powered by this extra-strength dose of proprietary Rennou, Theodent 300’s activity can be felt after your very first brush and is the pinnacle of Theodent’s research and development. Despite its power, Theodent 300 is also non-toxic and not harmful if swallowed. What does it taste like? Although Rennou comes from the part of chocolate that makes it bitter, it tastes minty and refreshing and doesn’t burn the sensitive oral tissue. 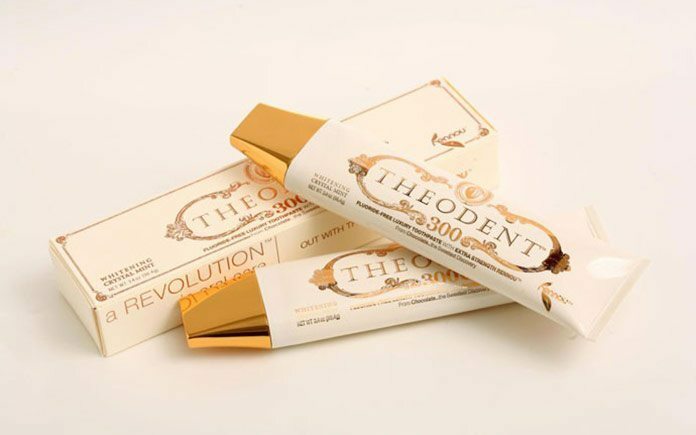 Theodent 300 is one of world’s most expensive toothpastes, with its price set at $99.99. The toothpaste comes in a white tube with a gold cap and gold lettering, a luxury style that reminds you about chocolate.